Made with love. Finest organic ingredients. 100% natural. Sweetened with coconut sugar. Dairy and gluten-free. Vegan. A smooth and rich dark chocolate made using the finest organic ingredients. Dark 76% raw chocolate meets a natural caramel flavour and pink Himalayan salt for a delicious combination. Naturally sweetened with organic coconut sugar, so you can enjoy guilt-free. 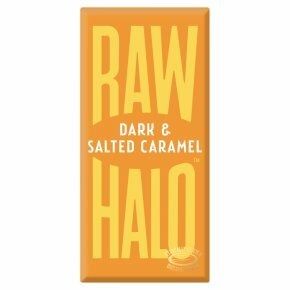 Raw chocolate, made with love Raw Halo was born through one girl's passion for healthy eating combined with a love for chocolate. Just like us, we want you to feel inspired to eat well without having to sacrifice life's little luxuries.